Ohio is an agricultural state. We have great soil and we use it, but most of us still buy our produce from big grocery chains and bypass the chance to keep our grocery dollars local. That’s a problem that we can change by shopping Farmer’s Markets, but those might not be as convenient as you would like. Ohio farmers have come up with an option. 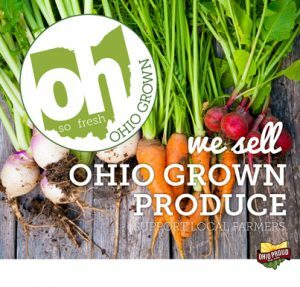 The Ohio Ecological Food and Farm Association, Ohio Grocers Foundation, Ohio Produce Growers and Marketers Association, and Ohio Department of Agriculture have partnered to launch a new initiative called OH So Fresh. Ohio has more than 2,000 specialty crop growers providing everything from asparagus to zucchini. You will be able to find this produce under the big OH So Fresh signs- similar to the image on this post. The only grocer in the Greater Dayton Area that is currently participating in this initiative is Fulmer’s Community Market in New Carlisle. Find out more about the OH So Fresh initiative here. Free New Carlisle home search!